For companies that use a lot of technical equipment, it can be extremely inconvenient to constantly have to keep plugging and unplugging cables from the back of the electronic device into the ethernet source. Luckily, you can avoid a lot of this hassle by using a patch panel, which will make it a lot easier to connect your devices. 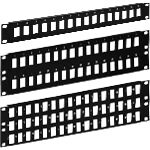 This set of unique 1U hinged extender brackets will fit all standard 19" or 23" EIA upright relay racks or cabinets allowing easier access. 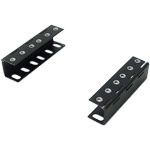 These unique 2U hinged extender brackets will fit all standard 19" or 23" EIA upright relay racks or cabinets and allow easier access. 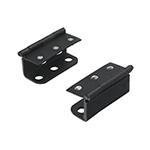 These powder coated steel brackets serve as an extension or small rack piece on most standard 19" cabinet units. 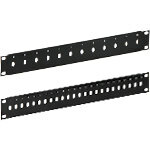 These 19" Filler Panels are used in mounting 19" racks or cabinets to fill gaps in the installation. Each unit comes with a full set of mounting hardware in both 12-24 and 10-32 washer head screws. These Keystone Panels are manufactured by Gruber, the leading cabling products manufacturer in the USA offering unprecedented Lifetime Warranty on these products. 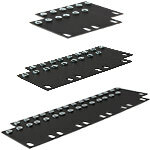 These feedthrough panels are maufactured here at Gruber, and were created for F-connectors in sizes ranging from 12-128 ports. 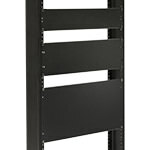 The BNC feedthrough panel mounts directly to any 19" rack or cabinet, and is manufactured here at Gruber. 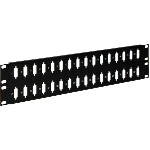 This black DB9/HD15 Feedthru Panel is manufactured at Gruber and mounts onto racks and cabinets. Customize it your way, using a universal mount, Male to Female and Left and Right. The DB15 feedthrough panels are created with premium cold rolled steel, and are made to mount onto racks and cabinets. 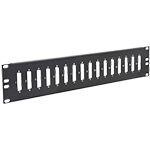 Great for connecting multiple PC serial ports from different sources to this 16 or 32 port panel that fits onto 19" standard racks. Ideal for both LAN and cross connect applications inside server racks or on 19" standard mount cabinets. 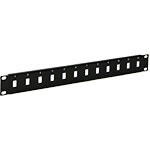 Designed for ST fiber connectors, this panel is an essential part of any server rooms with gigabit ethernet applications. By using a feed thru patch panel, you can simply plug the panel directly into the Internet source, and then plug any of the equipment you want connected into the open ports on the front of the panel, which makes it extremely easy to connect, disconnect, and perform tests. In addition to a patch panel, you might also find yourself needing to purchase a blank panel, or filler panel, to keep the system within your server rack organized and working properly. You can install a rack filler panel to conceal any open space within your server rack, which will in turn prevent the mixing of hot and cold air, therefore keeping your equipment cool, clean, and working properly. 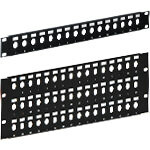 We offer BNC, DB25, DB15, DB9, Keystone, or blank patch panels. So whether you need an easier way to connect all of your equipment to the Internet, or you need to make sure that the equipment within your server rack is working properly, Gruber Communication Products has the solutions you need.